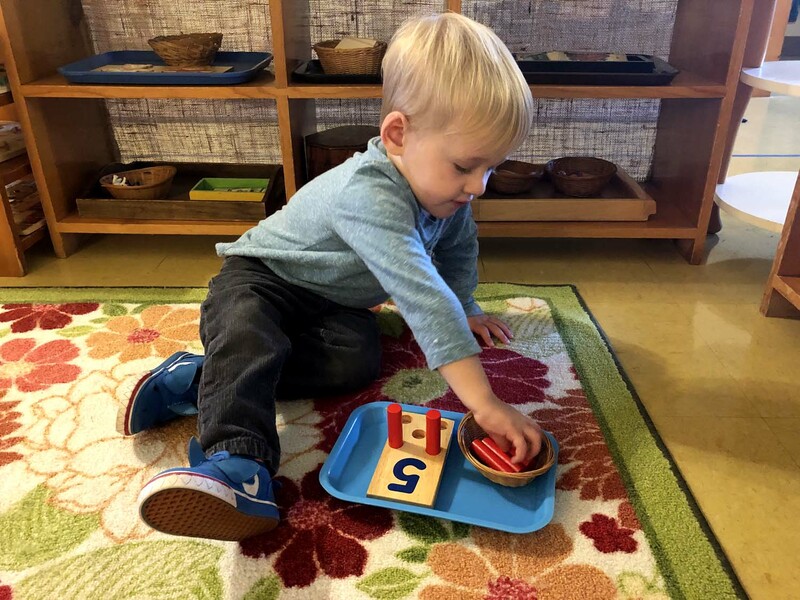 January is the fifth full month of the school year, so the number 5 is popping up around the classroom, including in this peg activity on the pre-math shelf in Ms. Sara’s toddler room. It was wonderful to see how eager the children were to return after winter break and get right back into the groove of school! I heard from parents that their child wanted to come back to school, and we could see it on their faces as they arrived. The children were excited to see their friends as they greeted each other with lots of hugs. This is beautiful and touching to see at any time, but especially in toddler since socialization is important during these years. The month of January focuses on weather, snow, snowmen, snowflakes, the color blue, winter/polar animals and cultures from around the world. There are lots of penguins, bears, cardinals and winter scenes throughout the classroom. Since it’s the fifth full month of school, the drop box is now at five, there is a number 5 book and five pegs to place in holes on the pre-math shelf. We normally might discuss what the weather looks like while we are indoors and outside as we are experiencing it. This month, we talk more about how aspects of weather are created and what it’s like in other areas of the world, especially where there are long periods of cold and snow covering the ground. We have felt weather representatives — a sun, white cloud, blue cloud, gray cloud, lightning bolts, raindrops and snowflakes — for group lessons. 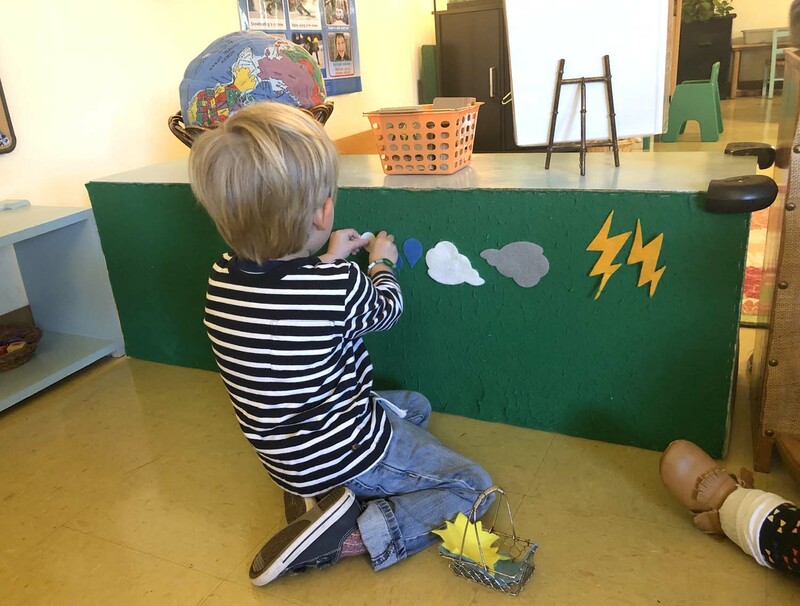 A child in Ms. Sara’s toddler classroom puts felt weather representatives on the back of a shelf. The class is expanding its discussions about the weather this month. While it’s cold outside and the children are wearing jackets, we have switched to mostly coloring with crayons on the large easel, but we offer sun and rain clouds for stamp painting on the warmer days. The art shelf offers mitten painting and hat gluing to go along with attire for cold weather. The sensory bin has fake snow that feels cool and wet, but it looks white and fluffy. There are Eskimos, sleds, an igloo, walrus, seal, orca, beluga whale, wolf, cardinal, snow rabbit, hares, reindeer and moose to go along with the snow. On the sensorial shelf, there is a color matching work with various shades of blue items and yellow items to place on the corresponding squares. We have a small hanging bag that contains only objects that are predominantly blue. 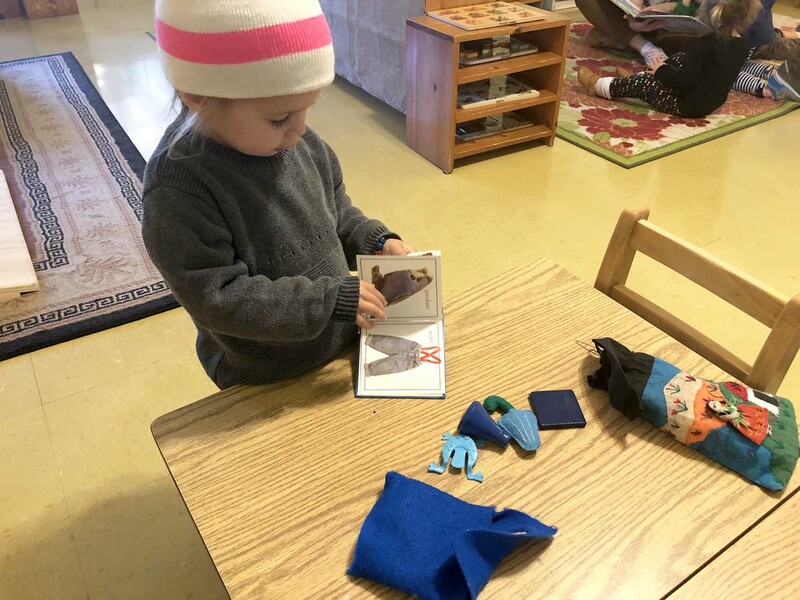 A toddler in Ms. Sara’s classroom looks through a book about the color blue from the bag containing items with January’s color. Children have the opportunity to build a snowman both with our stackable wood snowman pieces and the snowman gluing work. Another gluing work is the winter sky with stars, snowflakes and moon. These sometime use a glue stick and others a dabber with liquid glue to vary the application. Also on the art shelf is gluing/painting a penguin. We mix the glue and white paint so the children can glue the pieces on as well as paint snow on the penguin. Starting this month, we introduced scissors for paper cutting. If a child isn’t ready for scissors yet, we show them how they can tear the small piece of paper, working on this fine motor skill and toward the dexterity to handle scissors. The letter box is moving through the alphabet and now contains items beginning with the letter “I.” There is an insect, igloo, iguana, instruments, a letter card with upper and lower case “I” and a picture of ice cream. The letter book has pictures of ink, an iceberg, ice cream, iron, icicle, insects and an island. We go over the objects emphasizing the sound “I” is making in each word. When I presented the letter box at group time, I had ice cubes to pass around, and we talked about the reason they couldn’t stay in the letter box. Later, I showed the bag of water where the ice had melted. We have a globe pillow that can be used in discussions of places on the earth we live. There are a few works that tie in well with the globe including seven wooden people from each continent and the city/country matching. Another one is the “Children of the World” language cards that have a picture of people in traditional dress and the word for “hello” in their corresponding languages. Mr. Sun, Sun, Mr. Golden Sun, please shine down on me. Mr. Sun, Sun, Mr. Golden Sun, hiding behind the tree. So, Mr. Sun, Sun, Mr. Golden Sun, please shine down on me! Where is thunder, where is thunder? Hear it boom! Hear it boom! I’m all wet. I’m all wet. and didn’t wake up till morning. Great big snowflakes that do not make a sound. Give him a carrot nose and a tall hat. Now my little snowman, won’t you stay? Out comes the sun, and you melt away. Have you ever seen a penguin? A penguin? A penguin? Have you ever seen a penguin swim this way and that? Swim this way and that way? And this way and that way? The cutest little eyes, they can open and close. That’s the way my little eyes go. I have one little mouth, right below my nose. The cutest little mouth, it can open and close. That’s the way my little mouth goes. The cutest eyes and mouth, they can open and close. That’s the way my eyes and mouth go. North America, South America, Africa, Europe and Asia. Focus and concentration are very important for a child’s development. 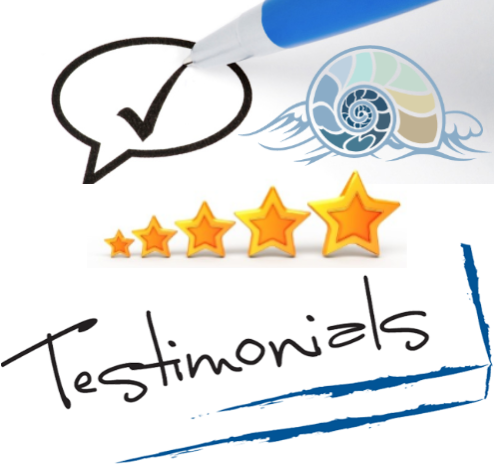 For this reason, we prepare a peaceful environment that encourages concentration and repetition of works. As you probably know the annual Wine Down and Silent Auction fundraiser is coming up on Feb. 9. Each child is making his or her mark as we work on the classroom project that will be available to bid on at the event. We are very excited about creating something that represents the whole class, and it is always fascinating to see what the children from all of the other classes make as well. Hope to see you there!